I love looking at license plates, too! 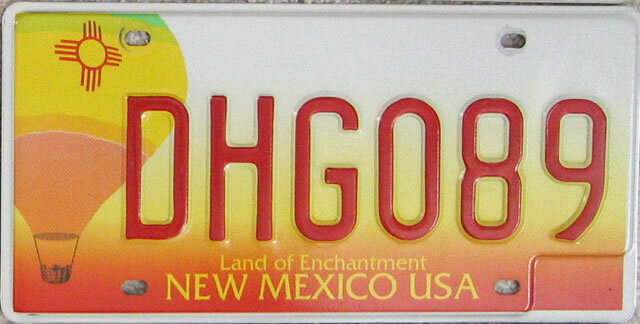 Have you seen the New Mexico (USA) centennial license plate? It's turquoise and I really like it. I bought the matching mug at the gift shop, I loved it so much. @Laura: Ooh, I will check that out! FUN FUN! SC used to have pretty ones, and now they are rancid. Being from NC I also get nervous over that DRAMA with Ohio. Hehehe. I am with you on the blue looking way better than the red. 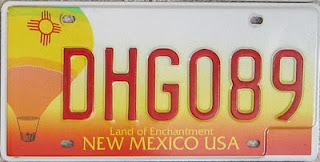 I was so sad when I had to upgrade my New Mexico plate from the old school yellow. Like Laura, I kinda like the new turquoise plates. 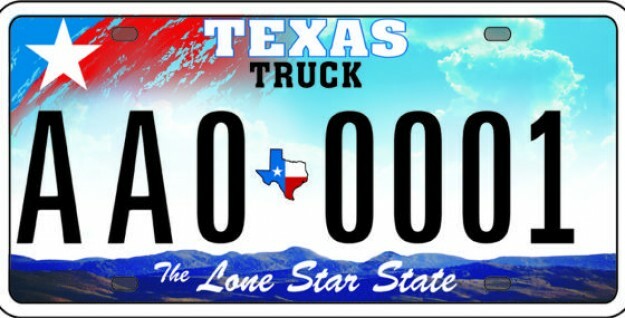 I was even more sad when I had to switch to Texas plates. I am SO glad we left Texas before the Brush Script Catastrophe happened. 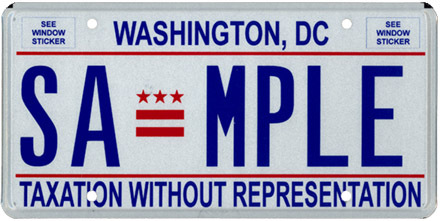 I also love our DC plates! Welcome to the club. Tee-hee! Yes, Texans know how to make anything look like it should be painted on the hood of a Chevy. I'm kind of surprised there isn't an armadillo in there, too. And a long horn. I'de like to see the runner-ups! I have always loved New Mexico plates. Oklahoma's are nifty too. New Hampshire's slogan "LIVE FREE OR DIE" kind of creeps me out when I see it on a bad driver. I share your love of licence plates. I actually have the picture at the bottom of your post hanging above my desk in my office. And I live in Oregon where we have very cool plates! In Florida, perhaps the only state more ridiculous than Texas, we have so many vanity plates it's hard to remember what the standard issue plate looks like. (I'm pretty sure it features an orange.) At last count I believe there were 123 different specialty plates available, including such gems as "Hispanic Achievers," "Discover Florida's Horses," and "Endless Summer." 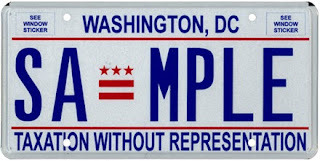 There was even legislation proposed to limit the number of vanity plates but I don't believe it ever passed. We like to keep things strange down here. I love this post! It had me laughing out loud. The only plates I've had besides DC were from Arkansas. 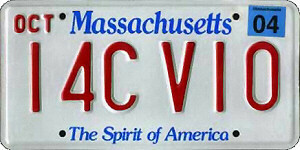 Back in the day, they were very simple and classic like the Massachusetts plate above. Now they're sort of a cheesy light blue/maroon with a big diamond behind the plate numbers. But I do love our slogan "The Natural State" - almost as much as I love DC's. I love license plates! I've tried to keep one from each state I've lived, but have also been lax about registering my car in a few...it's hard when you're just there a short time! My all time favorite is New Hampshire, not because it's very pretty but because of the slogan "live free or die"...indeed. This is oh so delayed, but I am going crazy with the DC DMV website right now and I remembered this post from awhile back. 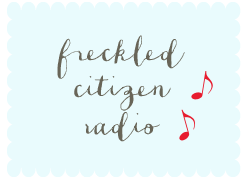 I'm moving up to DC in a week (eekk!!) and will only have street/neighborhood parking. Soo...does this mean I have to go to the DMV the very day I pull in to get the registrations and park legally on the street??? 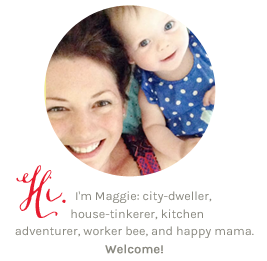 I'd love any DC advice (parking and otherwise) and I love keeping up with your blog! @Brigid: Congrats! Sadly, you're going to need to get to the DMV asap. You can also get a temporary parking permit at your local police station, if you need extra time to get to the DMV. That might be your best bet. Weekends you'll be fine, though. So annoying, I know! Being from the place with the dullest license plates in North America, British Columbia, I notice other license plates on cars all the time; they stand out against our white ones. 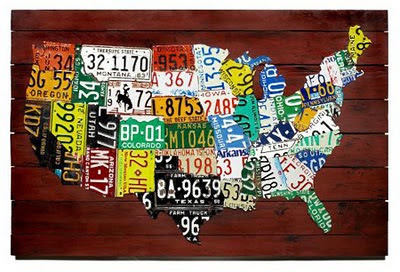 I am particularly partial to the license plates of the southern states with their song lyrics like, 'stars fell on Alabama,' and 'Georgia on my mind.' I also liked it when Tennessee and Louisiana got creative and made their license plates read BiCennTENNnial and LoUiSiAna, respectively. In 2010 our government issued a limited edition Olympics license plate which, though a nice offering, brings up another 'license plate issue:' A great image, but one that can only be appreciated if you are standing directly in front of it!' For those unfamiliar, the license plate features a very nice image of Whistler. However, it took weeks of seeing them on the road before I was finally behind one at a stop light before I could make out what was on it.